Just how accurate were these readings? Although it is impossible to verify everything Cayce said, some contend that his accuracy rate was over ninety percent! (2) But "with all his vaunted powers," writes Stearn, "Cayce was a humble man, religious, God-fearing, who read the Bible every day of his life. "(3) Indeed, Cayce read through the entire Bible every year and regularly taught Sunday school throughout his life. It is probably for reasons such as these that many people believe that the worldview of the readings is generally consistent with biblical Christianity. But is this really so? How well does the worldview of the Edgar Cayce readings compare with that of the Bible? Herbert Puryear writes, "The content of . . . the Edgar Cayce readings is . . . always Christ-centered, supporting the ultimate importance of the unique work of Jesus of Nazareth." (4) But as I hope to demonstrate in this article, such a claim can only be true by redefining the person and work of Jesus Christ to mean something quite different from what the Bible teaches. For instance Thomas Sugrue, Cayce's earliest biographer and long-time friend, begins his chapter on the philosophy of the readings by stating, "The system of metaphysical thought which emerges from the readings of Edgar Cayce is a Christianized version of the mystery religions of ancient Egypt, Chaldea, Persia, India, and Greece. "(5) The worldview of the readings actually has much more in common with New Age metaphysics and occult philosophy than it does with biblical Christianity. Although I have little doubt that, as a person, Cayce was kind and humble and motivated by a sincere desire to help his fellow man, it obviously does not follow that the worldview revealed in the readings is therefore true. And while I certainly acknowledge that Cayce regularly read and taught the Bible, it by no means follows that the philosophy of the readings is therefore biblical. According to Dr. Herbert Puryear, "More consequences for thought and action follow from the affirmation or denial of God than from answering any other fundamental question. "(6) It's difficult to overestimate the importance of this observation. Equally important, however, for those affirming the existence of God, is the kind of God they affirm to exist. There can be no doubt that God is of primary importance in the Edgar Cayce readings. The readings certainly affirm the existence of God, an affirmation that they obviously share with biblical Christianity. This being said, however, there is a marked difference in what each source affirms about the nature of God. Dr. Puryear writes, "The clearly articulated philosophy of the Edgar Cayce readings is a thoroughgoing monism." (7) The doctrine of monism claims that all reality is of the same essence. In other words, "All is one." Indeed, in the introduction to his book Dr. Puryear claims that "the oneness of all force" is the "first premise of the Edgar Cayce readings." What effect does this first premise have on the view of God presented in the readings? Dr. Puryear writes, "With the premise of the oneness of all force we affirm that God is, that He is all that is, and all that is, is God. "(8) This view is known as pantheism. It comes from two Greek words: pan, meaning "all" or "every," and theos, meaning "God." In other words pantheism, like the Edgar Cayce readings, teaches that everything is God -- a view substantially at odds with the biblical doctrine of God. Let's look, then, at what the Bible does say about God. Since the view of God presented in the Edgar Cayce readings is basically pantheistic, (10) it is also, by virtue of this fact, clearly unbiblical. Next we'll see how this effects the readings' presentations of both Christ and men. How did the view of a pantheistic God influence Cayce's doctrines of Christ and men? The Bible identifies man's primary problem as sin, a state of moral corruption that has infected our very nature. It is our sinful nature (and the sinful acts arising from it) that is the source of so many of our problems. The Bible warns us that "the wages of sin is death" (Rom. 3:23). Death is understood primarily as separation. Physical death is the spirit's separation from the body (Jas. 2:26); spiritual death is a person's separation from God (Eph. 2:1-7). All men are conceived in a state of spiritual death, alienated from their Creator and in need of reconciliation with Him (Ps. 51:5; Rom. 5:12; 2 Cor. 5:20). The Edgar Cayce readings offer a very different perspective on man's fundamental problem and how it should be solved. Before exploring this perspective, however, it's helpful to remember that the doctrine of God presented in the readings is essentially pantheistic: God is everything and everything is God. (20) We've already shown that this view is substantially different from that of the Bible. And as Douglas Groothuis observes: "Differing descriptions of ultimate reality lead to differing descriptions of the human problem and to differing prescriptions for its solution. "(21) Let's now see how the different descriptions of God in both the Bible and the readings contribute to their different perspectives on man's problem and its solution. Our summary reveals that while the readings' perspective on man's problem and its solution is unique, it more strongly resembles the viewpoint of non-dualistic Hinduism than biblical Christianity. It is important that Christians be aware of these differences. There are several difficulties with this position. First, the theological context of first century Judaism was decidedly theistic -- not pantheistic. (35) We should thus be very careful before concluding that Jesus taught His disciples about reincarnation. His statement probably meant no more than that John had come "in the spirit and power of Elijah" - just as the angel Gabriel had said He would. (36) Second, Jesus made His remarks after Elijah's appearance on the Mount of Transfiguration. But "since John had already . . . died by then, and since Elijah still had the same name and self-consciousness, Elijah had obviously not been reincarnated as John . . ."(37) If he had, then we should have read about Moses and John appearing to Jesus -- not Moses and Elijah! "Third, Elijah does not fit the reincarnation model, for he did not die. "(39) The Bible tells us that he was taken up into heaven while still alive! (39) And finally, such an interpretation would clearly contradict the passage in Hebrews cited earlier. Thus, I think we can safely conclude that Jesus did not teach the doctrine of reincarnation. 1) Jess Stearn, Edgar Cayce: The Sleeping Prophet (New York: Bantam Books, 1968). 2) Thomas Sugrue, There is a River: The Story of Edgar Cayce, rev. ed. (Virginia: A.R.E. Press, 1994), back cover. 3) Stearn, Edgar Cayce, 8. 4) Herbert B. Puryear, The Edgar Cayce Primer (New York: Bantam Books, 1982), 197. 5) Sugrue, There is a River, 305. 6) Puryear, The Edgar Cayce Primer, 229. 9) See, for example, Exodus 20:1-6 and Romans 1:18-25. 10) A rather unique feature of the particular version of pantheism presented in the Cayce readings is that "God" is viewed as, in some sense, personal. Dr. Puryear, in a discussion on meditation, writes, "The godhead we seek is a personal one . . ." (The Edgar Cayce Primer, 146). This certainly distinguishes the pantheism of the readings from that of most New Age literature (which tends to conceive of "God" as impersonal, rather than personal). Nevertheless, the view of God presented in the Edgar Cayce readings is still pantheistic and, therefore, unbiblical. 11) Sugrue, There is a River, 307. 12) Cited in Sugrue, There is a River, 320. 13) Puryear, The Edgar Cayce Primer, 221. 14) This, according to New Testament scholar D.A. Carson, is the real meaning of John 3:16. See Lee Strobel, The Case for Christ (Grand Rapids, Michigan: Zondervan, 1998), 161. 15) Sugrue, There is a River, 314. 18) See 1 Corinthians 15:3 and Romans 1:4; 4:25. 19) See John 3:16; Romans 6:23; Colossians 1:14. 20) Puryear, The Edgar Cayce Primer, 209. 21) Douglas Groothuis, Are All Religions One? (Downers 22) Grove, Illinois: InterVarsity Press, 1996), 24. 22) Sugrue, There is a River, 307. 26) Puryear, The Edgar Cayce Primer, 213. If we get the sense of such a Reality and affirm God, the oneness of all force, then we may take the next step and address that which the readings evaluate as the ultimate agenda for mankind: the living of the great commandment. We are to love God with all our heart, mind, and soul, and our neighbor as ourselves. 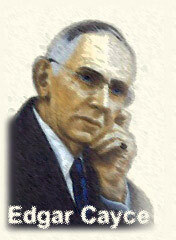 This Edgar Cayce represented as the ideal for all mankind and the answer to all the problems of mankind . . . A major hindrance and barrier to loving God and others lies in the inadequate understanding we have of ourselves, of our basic spiritual nature, of the spiritual nature of others . . . We must come to understand fully that we are spiritual beings and that all of us are children of God (Ibid., 229-30). Notice that it's only after we affirm this pantheistic notion of God that we may take the next step of living the Great Commandment (the solution to all our other problems). Thus, if we can first remember and reaffirm our oneness with God, we can then begin to recognize that, "As children of God, love is . . . the very nature of our being" (Ibid., 231). Armed with this knowledge, we can begin fulfilling the Great Commandment -- and watch our problems disappear! Of course, any Christian would certainly agree that fulfilling the Great Commandment is a worthy ideal for the human race. But there remains a serious problem. In the readings, both God and my neighbor have been redefined. They are supposed to be understood from within a pantheistic worldview. And, as I've already noted previously, this is quite different from a biblical worldview. Thus, what a Christian theist (on the one hand) and a pantheist (on the other) understand by fulfilling the Great Commandment is something very different indeed! 28) Puryear, The Edgar Cayce Primer, 213. 29) Noel Langley, Edgar Cayce on Reincarnation, ed. Hugh Lynn Cayce (New York: Paperback Library, 1971), 176. 30) Sugrue, There is a River, 202. 34) Langley, Edgar Cayce on Reincarnation, 173. 35) Norman L. Geisler and Ron Rhodes, When Cultists Ask: A Popular Handbook on Cultic Misinterpretations (Grand Rapids, Michigan: Baker Books, 1997), 106. 36) Ibid. See also Luke 1:17. 39) See 2 Kings 2:11. © 2002 Probe Ministries. Copyright/Reproduction Limitations This document is the sole property of Probe Ministries. It may not be altered or edited in any way. Permission is granted to use in digital or printed form so long as it is circulated without charge, and in its entirety. This document may not be repackaged in any form for sale or resale. All reproductions of this document must contain the copyright notice (i.e., Copyright 2007 Probe Ministries) and this Copyright/Limitations notice.